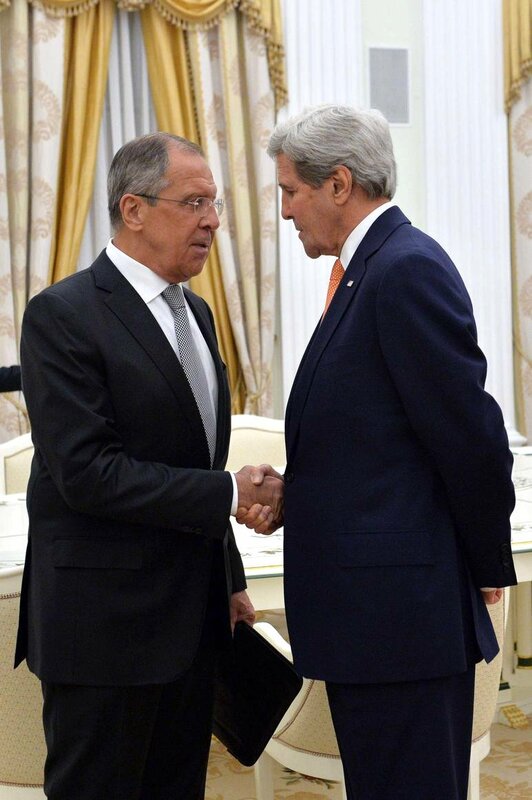 Russian Foreign Minister Sergey Lavrov and U.S. Secretary of State John Kerry in Moscow. Concrete steps towards Syrian settlement in line with agreements reached during U.S. Secretary of State John Kerry’s visit to Moscow were in focus of a telephone conversation between the Russian and U.S top diplomats, Sergei Lavrov and John Kerry, the Russian foreign ministry said on Aug. 5. "The sides discussed concrete steps Russia and the United States, as co-chairs of the International Syria Support Group, should take to implement the United Nations Security Council resolutions on Syria in line with the agreements reached during Kerry’s visit to Moscow on July 14-15," the ministry said. "The Russian side stressed the necessity to invigorate efforts against terrorist and other extremist groups operating ever more imprudently, which entails more casualties among civilians in Syria, including as a result of the use of chemical poisonous substances by militants," the Russian foreign ministry said. The conversation was initiated by the U.S. side.